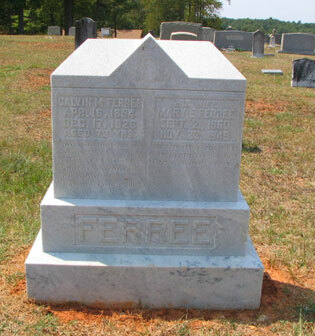 On June 4, 2006, a Ferree family gathering was held at the Giles Chapel United Methodist Church in Asheboro, North Carolina. The event organized by Sylvia Ferree Cox and her daughter, Donna Jernigan, was held to celebrate the unveiling of a monument to Solomon and Rebecca Ferree. 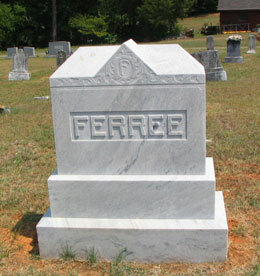 Solomon Ferree, son of John Ferree and Mary Elizabeth Musgrave and grandson of Madame Ferree, was the first Ferree to settle in North Carolina. 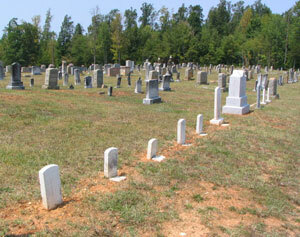 The monument is located in the Giles Chapel UMC Cemetery. Among other tombstones located in that cemetery are those of Calvin Madison Ferree, his wife, Mary Elma Lamb Ferree and their young children. Attendees at the Solomon Ferree memorial dedication were told any funds remaining after payment of the memorial would be used for a much needed cleaning and straightening of the Calvin Madison Ferree family tombstones. That has been completed thanks to the effort and contribution of Sylvia Cox. Sherman Fernando, s/o C.M. & M.E. Free 3 June 1887 - 26 June 1902 Age 15y 23d. Everet M. s/o C.M. & M.E. Free, d 3 June 1894 Age 5mo. 11days. Ferman M. s/o C.M. & M.E. Free d. 27 May 1888 Age 11mo. 24d. Fabeus A. s/o C.M. & M.E. Free d. Sep 1886 Age 6mo 5d. Bessie J. d/0 C.M. & M.E. Free d. 4 July 1881 Age 23d. Inf. d/0 C.M. & M.E. Free (no dates). 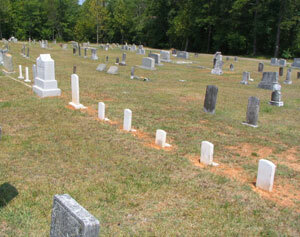 On the other side of the parents stone are three Ferree children tombstones also cleaned. Mary Ethel, inf. d/o D.W. and M.J. Ferree, 1 Oct 1897 - 30 May 1898. Infant d/o D.W. M.J. Ferree, 18 Nov 1888 - 25 Nov 1888 Age 5 days. Reuben F. Ferree, 6 Jan 1895 - 4 May 1910 Age 15y 4m 18d. Photos, names, and dates for this page courtesy of Sylvia Cox.